In large bowl, beat brown sugar, shortening, molasses and water with electric mixer on medium speed, or mix with spoon, until well blended. Stir in remaining ingredients. Cover and refrigerate at least 2 hours. Heat oven to 350°F. Grease cookie sheet lightly with shortening or spray with cooking spray. On floured surface, roll dough 1/4 inch thick. Cut with floured gingerbread cutter or other shaped cutter. On cookie sheet, place cutouts about 2 inches apart. Bake 10 to 12 minutes or until no indentation remains when touched. Immediately remove from cookie sheet to cooling rack. Cool completely, about 30 minutes. In medium bowl, mix powdered sugar, vanilla and half-and-half until frosting is smooth and spreadable. Add food colors as desired. Frost cookies; decorate with raisins, chocolate chips and candies. Versatile gingerbread! Did you know that a few crumbled unfrosted gingerbread cookies make an excellent thickener for pot roast gravy? Using a container of Betty Crocker® frosting can save you a few precious moments during the busy holiday season. Rise to the occasion! If using self-rising flour, there is no need to add baking soda and salt. Making and decorating gingerbread cookies is a fun tradition during the holiday season. Setting up a decorating station is a great way to keep children occupied during a cookie swap or holiday party. 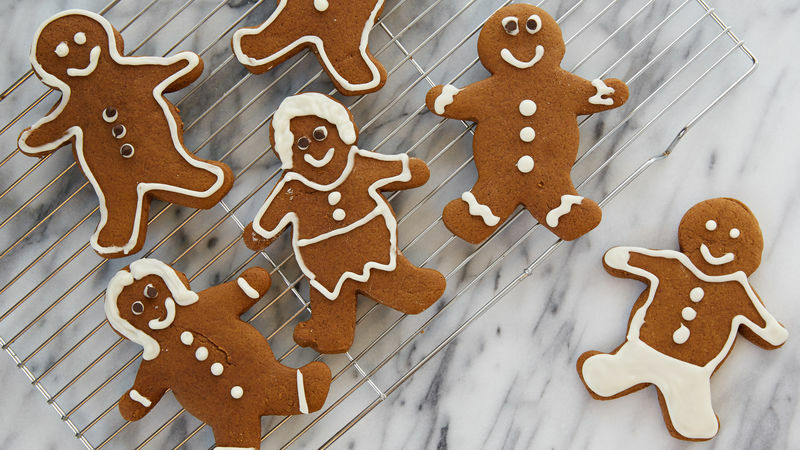 Kids can get as creative as they like with these gingerbread boys and girls as a blank canvas. If you want to start this recipe ahead to save yourself some time during the crazy-busy holiday season, unbaked cookie dough can be stored tightly covered in the refrigerator for up to 48 hours. Expecting some gluten-free guests to your holiday party? This gluten-free gingerbread cookie recipe is an excellent option to make for them. Want to know how to bake the perfect cookies every time? We’ve got 10 tips to get you started!